The NYCQ Tokens are Ethereum-based smart contract digital tokens representing indirect fractional non-voting economic interests in the sole limited partnership interest of NYCQ Fund LP held by NYCQ Venture Capital Ltd. The NYCQ Tokens are intended to capture value for investors by minimizing the liquidity discount of private securities investing through the issuance of a transferable security on the blockchain. The currency of the NYCQ Token will be in U.S. dollars and each NYCQ Token will be issued at a price of $1. Subscribers may subscribe for NYCQ Tokens in U.S. dollars, Bitcoin or Ether. NYCQ VC is a venture capital fund for the digital age. The NYCQ Fund will seek to make equity investments into blockchain infrastructure companies and foundational applications for blockchain technology. NYCQ VC’s investment partners are venture investors and blockchain thought leaders with past successful deal-flow and track records of identifying promising companies and generating returns. The NYCQ Tokens are additionally intended to capture value for investors by minimizing the liquidity discount of private securities investing through the issuance of a transferable security on the blockchain. All following entities are subsidiaries of CityBlock Capital Corp., a Delaware Corporation. Management Fee: NYCQ Fund will pay to NYCQ GP an aggregate management fee equal to 2.0% of the total proceeds of the Offering per year for a period of 8 years. Carried Interest: NYCQ Fund will keep 20% of all profits generated from Realizations for distributions to local investment partners and NYCQ GP as carried interest (which will be structured as an allocation of investment gains recognized by NYCQ Fund). 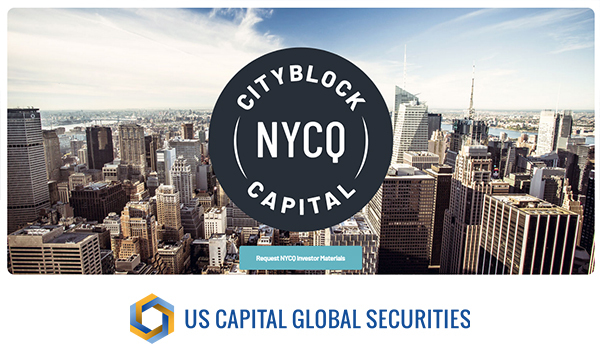 The NYCQ Fund seeks to achieve long-term capital appreciation through equity and equity-related investments in early-stage technology companies, primarily blockchain related. The fund will be backed by a team of venture investors and blockchain thought leaders with past successful deal-flow and track records of identifying promising companies and generating returns. The fund is managed and advised by professionals with deep industry experience from firms such as SoftBank Capital, Goldman Sachs, and Google. The NYCQ Fund will focus on the next generation of financial technology — blockchain and digital assets. Trade in digital assets has already shown huge growth among consumers, captured by U.S. exchanges such as Coinbase and Poloniex. The fund will invest in companies that are building the framework for the emerging security token ecosystem — a picks-and-shovels strategy. The NYCQ Fund portfolio company investments are equity or digital equity. Approximately 80% - 90% of investments are into early stage venture backed companies. The balance is invested in later stage venture backed companies. The fund does not invest in “utility tokens” or cryptocurrency. 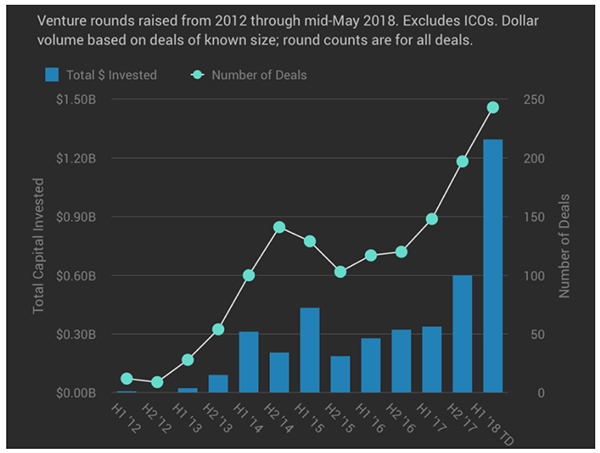 The rise of Digital Assets is poised to create a rush of liquidity that could help grow venture capital, allowing venture funds to accelerate returns through earlier exits (from more liquid securities) as developments occur within their portfolios. Blockchain is a digital ledger that uses cryptography to facilitate transactions. A blockchain is a secure record of transaction, much like a traditional ledger – facilitating safe transactions for the movement of money, goods or services via a distributed encrypted smart contract. Smart contracts on blockchains potentially allow the performance of credible, trackable and irreversible transactions without third parties. Purchased tokens can be sold again by NYCQ VC and persons acquiring resold NYCQ Tokens may be required to hold the tokens for one year. Over the last 30 years, VC firms have played an integral role in identifying and growing many of the world’s most transformational companies from idea to ‘unicorn’ classification. Despite the industry’s immense growth globally, traditional VC fund operating structures require 5 to 10 years of locked-up capital which are comparatively inefficient to new blockchain enabled ownership methods. The NYCQ Fund is designed to give investors diversified access to blockchain infrastructure investments normally only accessible to institutional investors. Target investors for the fund include high net worth individuals and global investors who have generally been excluded from the venture capital asset class. NYCQ tokens are engineered to facilitate regulatory compliant trading on SEC approved ATS exchanges. Purchased tokens can be sold again by NYCQ VC and persons acquiring resold NYCQ Tokens may be required to hold the tokens for one year. Venture capitalists’ appetite for software companies showed no sign of slowing during the first half of 2018. According to the latest PitchBook Venture Monitor, VC funding may top $100 billion¹ for the first time since the dot-com days – and as of June 30, software start-ups received 40% of that investment. The plot below displays worldwide venture investment in blockchain and blockchain-adjacent start-ups. Rob Nance is a co-founder and managing partner of CityBlock Capital. Mr. Nance is responsible for fundraising, capital strategy and other capital markets initiatives across CityBlock. Mr. Nance is also a co-founder of Edgewater Equity, a fully invested early stage venture capital fund based in NYC. Mr. Nance holds a Bachelor of Science in Finance from Winthrop University and Master of Science of Law in International Taxation from Thomas Jefferson School of Law. Max Goldstein is an entrepreneur working at the intersection of technology, marketing and operations. While at Google, Mr. Goldstein started and led a 90 person community team responsible for partner onboarding and content development on Google+. The program was a strategic catalyst in making Google+ the fastest growing website in history. Mr. Goldstein also supported product launches and created partnerships across Google Maps, Google X and Search. As a startup founder and consultant, Mr. Goldstein has led product development, digital content strategy and business development with venture backed companies and crypto projects. Mr. Goldstein holds a Bachelor of Arts in History and Political Science from Bucknell University. Nikhil Kalghatgi is a former Partner at Vast Ventures and Principal of SoftBank Capital. Mr. Kalghatgi is a moonshot investor, leading 30+ deep technology investments. Mr. Kalghatgi formerly worked in US Military Intelligence, completed his MBA at Harvard Business School and BS/MS in software and hardware engineering design. Mr. Kalghatgi is the founder of The Necker Summit which seeks to create massive impact through for-profit businesses. Mr. Kalghatgi speaks on crypto and technology on CNBC, Bloomberg TV and lectures at Stanford Graduate School of Business. Ateet Ahluwalia is the Managing Director and PM of CoVenture Crypto's Active Fund. Mr. Ahluwalia is a former Portfolio Manager at Bluecrest Capital covering Global Macro with a focus on Fixed-income, Equity, and FX through spot and options markets. At Goldman Sachs, Mr. Ahluwalia traded European CDS Index through the GFC and led the Index Desk through the European Sovereign crises, focusing on relative value, arbitrage, and one-delta strategies. Mr. Ahluwalia received his B.A. in Applied Mathematics and Economics from Northwestern University. Mark Yusko is the Founder, CEO and Chief Investment Officer of Morgan Creek Capital Management. Prior to forming Morgan Creek, Mr. Yusko was President, Chief Investment Officer and Founder of UNC Management Company. Throughout his tenure, Mr. Yusko directly oversaw strategic and tactical asset allocation recommendations to the Investment Fund Board, investment manager selection, manager performance evaluation, spending policy management and performance reporting. Total assets under management were $1.5 billion ($1.2 billion in endowment assets and $300 million in working capital). Anthony "Pomp" Pompliano is a Partner at Morgan Creek Digital and a regularly featured author and thought leader for blockchain industry on national television, press outlets, and social media platforms. Mr. Pompliano previously co-founded Full Tilt Capital, one of the fastest growing early-stage US venture capital firms. Mr. Pompliano also led numerous Product and Growth Teams at Facebook and Snapchat and successfully built industrial-grade cryptocurrency mining facilities. Mr. Pompliano served as a US Army Sergeant in Operation Iraqi Freedom. Jon Avidor is the founder of Startup.Law and World Trade Ventures. He previously practiced law at Sullivan & Cromwell LLP (NYC) and Goodwin Procter LLP (Silicon Valley), focusing on venture capital, private equity, real estate and M&A for clients ranging from banks such as Goldman Sachs and Barclays to venture capital leaders such as Khosla Ventures. Jon has represented clients in company sales to Intel, PayPal and LinkedIn and holds a JD-MBA from Northwestern, where he graduated with honors. • There can be no assurance that you will receive a return on your investment in NYCQ Tokens and you may lose the full value of your investment. • The NYCQ Tokens are subject to significant transfer restrictions that may adversely impact your ability to resell the NYCQ Tokens and the price at which you may be able to resell them, if at all. • There is no existing trading market for the NYCQ Tokens and there can be no assurance that a secondary market will develop for the NYCQ Tokens. If a secondary market does develop, there can be no assurance that it will provide the holders with liquidity for their investment or that it will continue for the life of the NYCQ Tokens. • NYCQ VC has the right to redeem the NYCQ Tokens at any time after ten years or earlier upon the occurrence of certain events. The amount for which we redeem your NYCQ Tokens may be below market price or below the price at which tokens are sold in this Offering. • To the maximum extent provided by law, none of NYCQ VC, NYCQ Fund or CB Manager will owe you any fiduciary duties and NYCQ VC shall have no obligation to exercise any rights it has under the Limited Partnership Agreement of NYCQ Fund. • Holders of the NYCQ Tokens will not be entitled to any voting or distribution or liquidation rights with respect to the NYCQ Tokens, NYCQ VC or NYCQ Fund. • The tax characterization of the NYCQ Tokens is uncertain and a subscriber must seek its own tax advice in connection with an investment in NYCQ Tokens. An investment in the NYCQ Tokens may result in adverse tax consequences to subscribers, including withholding taxes, income taxes and tax reporting requirements. It is also possible that the income of NYCQ VC or the NYCQ Fund would be subject to significant amounts of income and/or withholding taxes. •	Identifying and participating in attractive investment opportunities and assisting in the building of successful young/emerging enterprises is difficult. There is no assurance that the NYCQ Fund’s investments will be profitable and there is substantial risk that the NYCQ Fund’s losses and expenses will exceed its income and gains. •	The NYCQ fund will be organized under the laws of the Cayman Islands, which differ in significant respects from United States law. •	An investment in the NYCQ Fund is a long-term commitment and there is no assurance of any distribution to the Limited Partners. •	The venture capital/private equity business is highly competitive and has become more so in recent years due to a substantially increased flow of capital into venture capital/private equity funds and similar investment organizations. •	The NYCQ Fund’s investment program is intended to extend over a period of years, during which the business, economic, political, regulatory, and technology environment within which the NYCQ Fund operates is expected to undergo substantial changes, some of which may be averse to the NYCQ Fund. 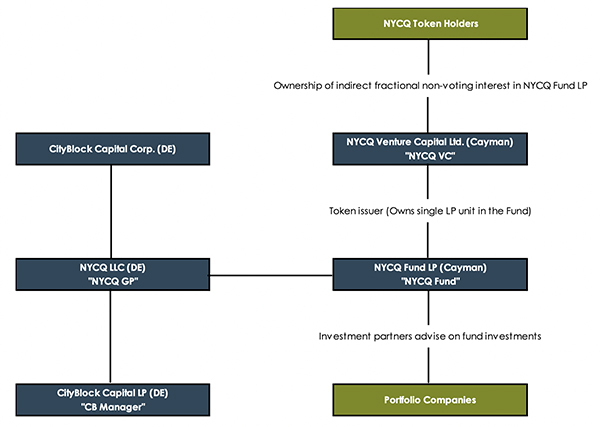 •	The NYCQ Fund’s investment sourcing, selection, management and liquidation strategies and procedures may deviate from those described in the Private Placement Memorandum for reasons including changes in the external environment as well as changes and opportunities faced by the NYCQ Fund’s portfolio companies. 4. For a complete set of risk factors, please refer to the Private Placement Memorandum.